In this tutorial, we'll explain how to work with sprints in Jira Software. Note that the team rituals you do outside Jira Software - like sprint planning meetings, retros, and daily standups - won't be covered here. You can read up on those in How to do scrum with Jira Software. A sprint is a fixed time period where teams complete work from their product backlog. Sprints are usually one, two, or four weeks long. At the end of the sprint, a team will typically have built and implemented a working product increment. Go to the Backlog of your Scrum project. Click the Create Sprint button at the top of the backlog. Note that you can create more than one sprint, if you want to plan work several weeks in advance. Once you've created your sprint, you'll need to fill it with issues. Before you do this, make sure you sit down with your team and discuss what work you'd like to commit to doing. Ensure you add enough work for everyone in the team. How many issues should we add? The first time you do this, you might not know how many issues to add. But that's okay - that's something you can figure out over time. To help with this, before you start adding issues to the sprint, have the team estimate their issues. Once the sprint is over, you'll then see how much effort the team was able to devote to the sprint. Over time, you'll be able to get a feel for the team's capacity for work, which will help you plan future sprints accordingly. Learn more about estimation at our How to do scrum with Jira Software guide. Drag and drop issues from the Backlog onto your sprint. 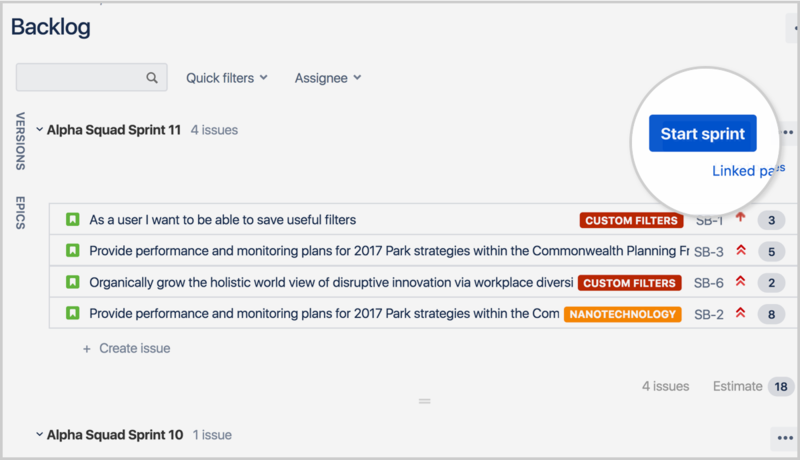 Note that you can also add an issue to your sprint by editing the issue and updating the Sprint field. Once you've added issues to your sprint and the team is ready to work, you'll need to start the sprint. The sprint is at the top of the backlog. If you want to start a planned sprint that is lower down, you'll need to reorder your sprints to move it to the top. Find the sprint that you want to start and click Start Sprint. Update the Sprint name and add a Sprint goal if you want to, and select the Start date and End date for the sprint. How long should our sprints be? If you're not sure how long your sprints should be, we recommend 2 weeks - that's long enough to get something accomplished, but not so long that the team isn't getting regular feedback. During the sprint, you'll probably want to monitor the team's progress. One way of doing this is by viewing the Sprint Report. What should we be doing during our sprints? During sprints, teams work together to complete the stories they committed to at the start of the sprint. This typically requires a lot of collaboration, so we recommend doing team standup meetings every day, so you know what everyone in the team is working on. Navigate to the Active sprints of your Scrum board. If necessary, select the sprint you want to complete from the sprint drop-down. Note that if you have multiple sprints in the Active sprints of your board, the 'Complete Sprint' button will not appear until you select one of the sprints. Click Complete Sprint. All completed issues will move out of Active sprints. Mark your epic as done whenever all work for the epic is complete. To make this easier, we recommend coming up with a clear definition of done for your epic create it. Any stories linked to the epic don't have to be complete to mark an epic as done. 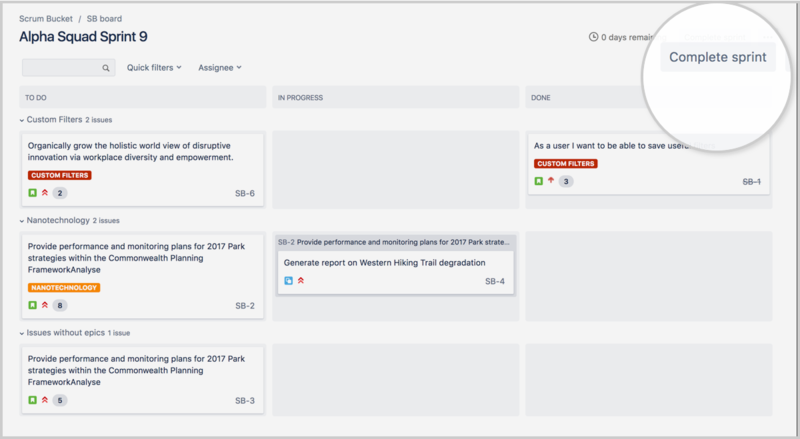 If you want to learn more about adopting scrum for your team, head to our How to do scrum with Jira Software guide. For more detailed information on working with sprints in Jira Software, check out our sprints documentation.